Another year sure has flown by, hasn't it? Hard as it is to believe, it's already time to start thinking about 2016. 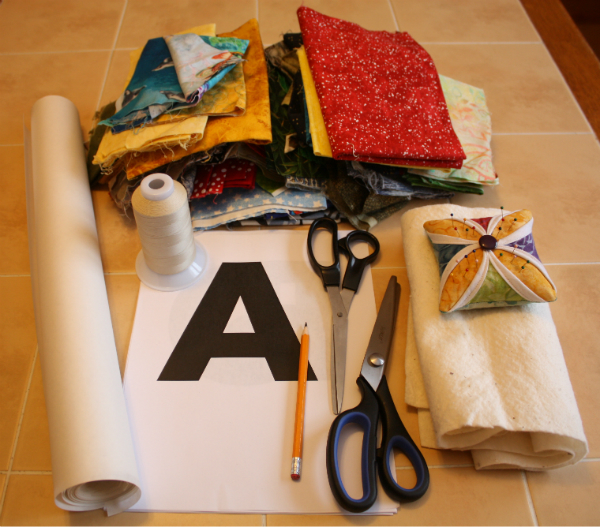 Yvonne at Quilting Jet Girl is hosting the 2016 Planning Linky Party for everyone who wants to set quilting and blogging goals for the year. Now, I've never really been much of a long term planning person, but over the past couple of years I've been noticing two things about myself that keep me from getting done as much as I'd like to get done. 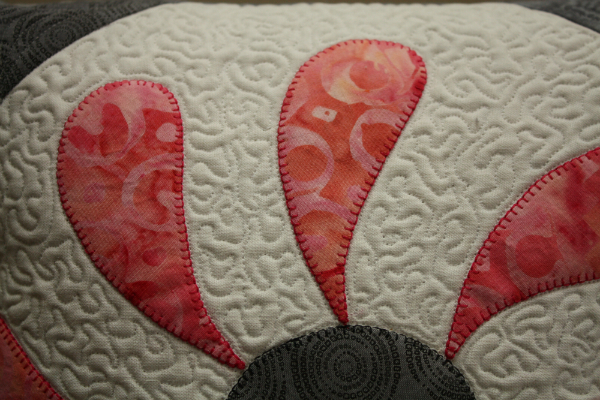 First, I tend to procrastinate, even on stuff I really want to be doing, like quilting and blogging. Maybe having goals written down and shared will help me buckle down and get 'er done. Second, I'm easily distracted by new things I want to try. This seems to be a fairly common trait among us quilters, and can be lots of fun sometimes, but I want to try to keep myself a little more on track. 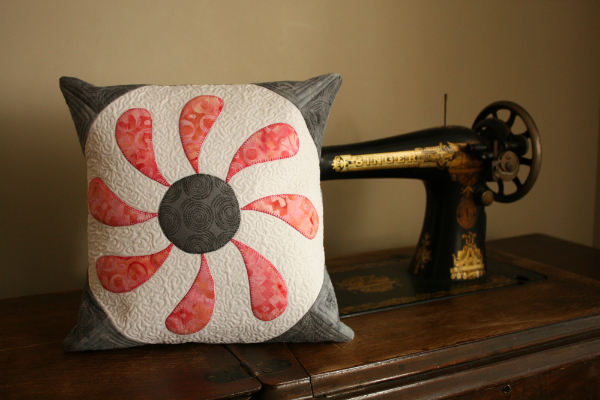 I'd love to make a career out of quilting and designing, so procrastinating and getting off track really aren't useful! *Host a mystery quilt along. It's something I've been wanting to do for a while, but I've hesitated because I worried my following was too small. In emailing with Cheryl at Meadow Mist Designs, though, she pointed out that a small following might be a good thing for a first quilt along. So, the quilt is designed and I'm ready to pick out fabric and make my test version. I'm thinking maybe a late winter/early spring start. Anybody interested??? I released the Friendship Galaxy and Flower Box patterns in 2015. Do you set goals or make resolutions at the start of a new year? Since this is new for me, it will be interesting to look back a year from now and see how I did on these goals. There are a couple of parts of the Christmas story that happened after the day of Jesus' birth, one of which is the visit of the Wise Men. These mysterious men recognized Jesus as being king before anyone else did, and they sought Him out to offer their worship. "After Jesus was born in Bethlehem in Judea, during the time of King Herod, Magi from the east came to Jerusalem and asked, 'Where is the one who has been born king of the Jews? We saw his star when it rose and have come to worship him'...After they had heard the king, they went on their way, and the star they had seen when it rose went ahead of them until it stopped over the place where the child was. When they saw the star, they were overjoyed. On coming to the house, they saw the child with his mother Mary, and they bowed down and worshiped him. Then they opened their treasures and presented him with gifts of gold, frankincense and myrrh.” (Matthew 2:1,2, 9-11). The Bible doesn't tell us much about the Wise Men. Though we normally assume there were three of them, because there were three gifts, the Bible doesn't even tell us how many of them came to Jesus. We know they were astronomers/astrologers who saw the star and recognized it as having meaning; they came from the east; and they were Magi, or wise men. That's about it. 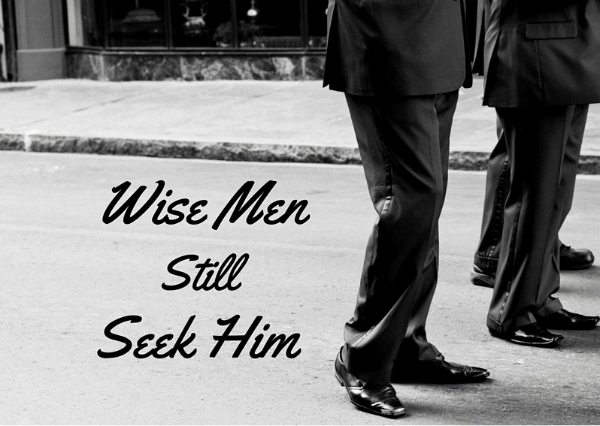 "Wise men still seek Him" is a phrase I've seen many times, usually in a graphic with silhouettes of three men on camels, and I've always liked the phrase. I've always taken it to mean that wise people seek Jesus...as in, the fact that we are seeking Him is proof of our wisdom. That's not what the Bible teaches, though. Psalm 111:10 says, "The fear of the Lord is the beginning of wisdom; all who follow his precepts have good understanding." Proverbs 1:7 says, "The fear of the Lord is the beginning of knowledge, but fools despise wisdom and instruction." Proverbs 9:10 says, "The fear of the Lord is the beginning of wisdom, and knowledge of the Holy One is understanding." Now, Nathan has had trouble understanding the concept of 'the fear of the Lord', and so I've had to explain it to him a couple of times lately. Like Nathan, you may think it strange that the Bible says we are supposed to be afraid of God, but that's not actually what these verses mean. It's not that we are to be afraid of God, like I would be afraid of a big, snarling dog or like Nathan is afraid of the dark. Rather, it is that we are to hold Him in reverent awe, to realize that we are sinful people and God is holy and righteous. It is not that we are to be afraid, but that we are to feel a sense of our unworthiness, along with an acknowledgement of His worth. So, once we have that sense of our unworthiness, along with an acknowledgement of His worth, that is the beginning of wisdom, because that is the beginning of us aligning our lives with His will, the beginning of us wanting to live His way. Wise men (and women!) still seek Him. It's true, but it is not because we are wise that we seek Him. We are wise because we seek Him. Seeking Him...knowing Him...'the fear of the Lord'...these are what give us wisdom. Can you believe this is the last week of Advent? It's amazing how fast this month has gone by! For the first three weeks of Advent, we looked at Hope, Peace and Joy. This week we look at Love. When we think about Christmas, it all comes down to love, wouldn't you say? That's why that first Christmas happened, after all. "For God so loved the world that he gave his one and only Son, that whoever believes in him shall not perish but have eternal life" (John 3:16). Jesus came to earth as a baby, destined to grow into a man who would die on a cross, because of God's love for the world. Sometimes it's hard for people to really believe that God's love is for them. The phrase 'the world' feels rather impersonal, so much so that it's possible for some to feel that God may love 'the world', but He can't possibly love them. In order to remedy that, I've heard people suggest we put our own names in the place of 'the world', so that I would say, "For God so loved Leanne..." and you would say, "For God so loved Martina..." or "For God so loved Jasmine...". That still doesn't really work for me, though. I find it feels too formal and stiff. How much better to simply say, "For God so loved me that he gave his one and only Son." There's nothing impersonal about that! Not everyone will believe it, of course. Some still believe that they've done so much wrong in their lives that God couldn't possibly love them. How wrong they are! "But God demonstrates his own love for us in this: While we were still sinners, Christ died for us" (Romans 5:8). Did you see that? While we were still sinners, Christ died for us. It has nothing to do with the things we've done right in our lives, and it has everything to do with His love for us. He came that first Christmas because God loved us enough to want to "[rescue] us from the dominion of darkness and [bring] us into the kingdom of the Son he loves" (Colossians 1:13). Even more, the very fact that He did this while we were still sinners is proof of His love! He didn't wait until we realized how wrong we were, or how much we needed Him. He certainly didn't wait until we asked for help. He loved us so much that He came to our rescue before we even realized we needed to be rescued. God doesn't love any of us because of all the right things we've done. He just loves us because we are His, and the demonstration of that love began with the little baby who was laid in a manger. This is the third week of Advent. For the first two weeks we looked at Hope and Peace and this week we look at Joy. Last Monday or Tuesday, when I was thinking about what I would write for this devotion, my thought process went something like this: "Next week is 'joy'...what will I say about joy?... "for the joy set before Him"...well, that's not very Christmassy, is it?...there must be something about Christmas and joy" But no matter how much I thought about it, that one verse of Scripture was the only one that came to mind. And the more I thought about it, the more it seemed to fit for Advent, even if it says nothing about the manger or the angels or the prophecies that Jesus fulfilled by His coming. What is the verse? "For the joy set before him he endured the cross, scorning its shame, and sat down at the right hand of the throne of God" (Hebrews 12:2). Truth be told, Jesus endured an awful lot before He ever got to the cross. To begin with, He endured being confined to a physical body, completely dependent on two imperfect humans to feed, cloth and protect Him. Remember, Jesus existed as God long before He ever came to earth as a baby. He endured being tempted to sin. He endured being hated by the religious leaders. They professed to be waiting for the promised Messiah, all the while hating the One who stood in their midst. He endured having some of His followers leave Him when His teachings became too hard for them to embrace. He endured being betrayed by a friend. He endured being abandoned by the rest of His friends at the moment following Him looked dangerous. One of His closest friends denied even knowing Him. Jesus not only endured it when it happened, He knew it was going to happen and had to endure that too. And then, after everything else, He endured the physical anguish of the cross. Why? Why would He willingly endure all of that? We are told it was "for the joy set before Him," and the amazing thing is that we are that joy! Everything that He endured, beginning with His incarnation as a baby right up to His death on the cross, was part of the plan to gain our salvation. To Jesus, the joy of an eternity spent enjoying our company in heaven was worth everything He endured while here on earth. Isn't that an incredible thought? We think a lot about the joys that will be ours in heaven. About a time when "'He will wipe every tear from [our] eyes. There will be no more death’ or mourning or crying or pain, for the old order of things has passed away" (Revelation 21:4). We think about how good it will be for us. But Hebrews 12:2 tells us that Jesus will experience joy because we are there with Him! So, if you ever doubt your worth, remember that Jesus came to earth as a baby, knowing what would happen while He was here, and that He did it all for the joy of being with you forever! Now that my brother, Adam, and sister-in-law, Sandrine, have received their quilt, I can finally share it here! 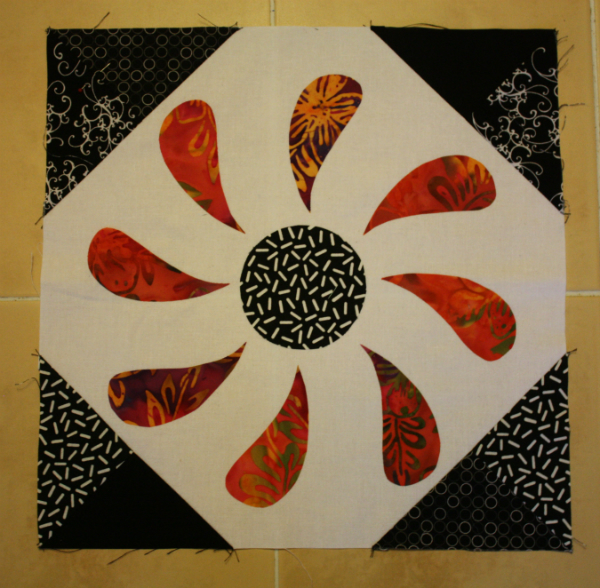 I debated for a long time what pattern I wanted to use for their quilt. 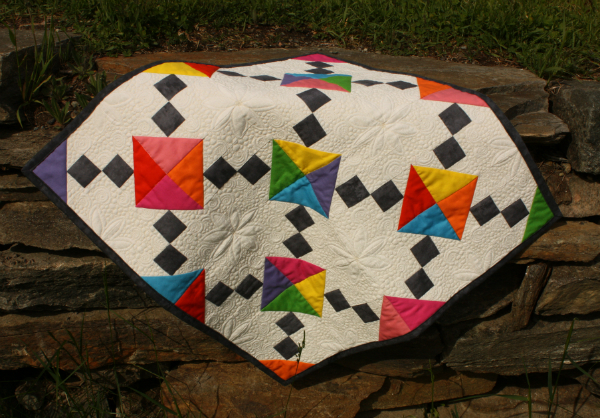 Then Lee, of Freshly Pieced, posted a tutorial for a Jewel Box baby quilt, which I loved. I upsized it from Lee's 4 block x 4 block layout to an 8 x 9 layout and ordered Kona solids for the top. While we were in Nova Scotia last Christmas, Mom, Sandrine and I went fabric shopping. 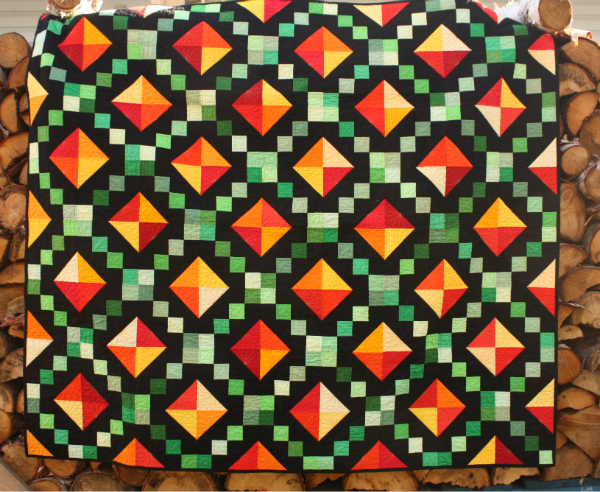 Sandrine was constantly drawn to quilts made in autumn colours, and was also wearing a scarf in those colours, so I chose red, orange, yellow, green and black for their quilt. 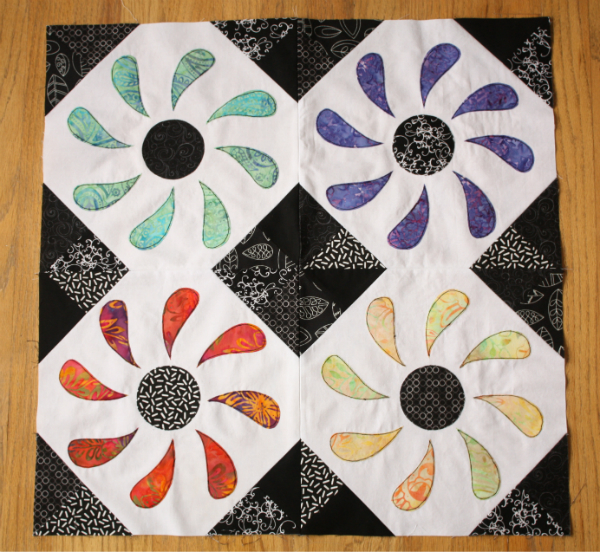 What amazes me about this quilt is that no one would ever guess it is exactly half black.Every single coloured piece is paired with a matching black piece, and yet the black seems to take up so much less of the quilt. Those bright colours really do pop, don't they? 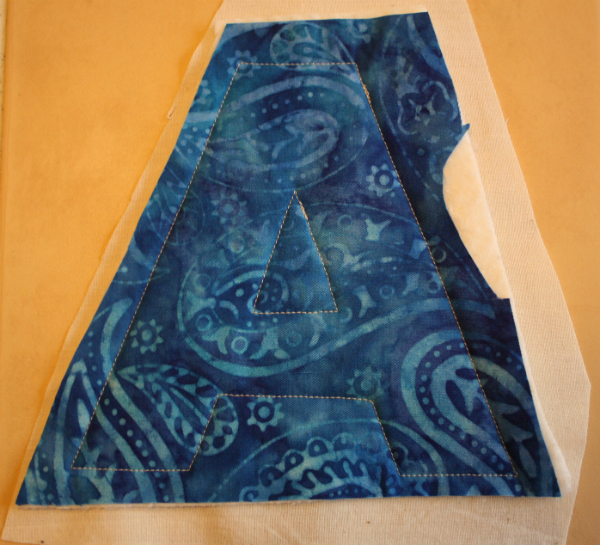 I quilted the triangles first and had a lot of fun with this design. I marked the center point of the long side of each triangle and then just freehanded the design. That means no two are exactly alike, but they seem to work okay as a whole. Pardon these linty pictures...that Kona black really shows up every little bit of fluff! 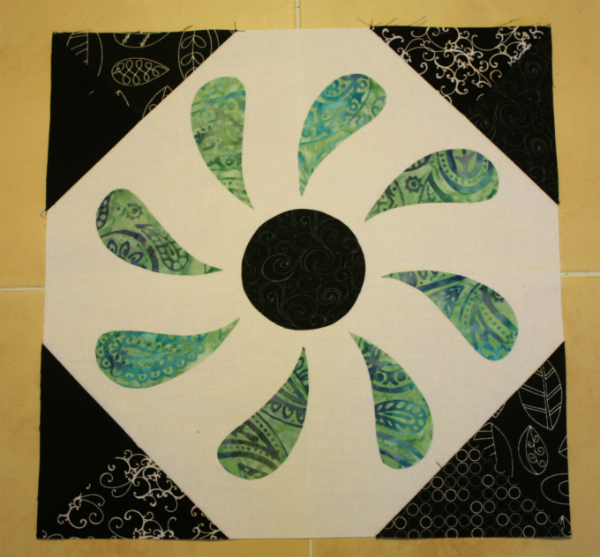 I had no idea how I would quilt the black part of the quilt, so next I started in on the green squares. I tried quilting these in lines as long as I could manage without needing to stop and start again, so these quilted up really quickly. Again, no two squares look exactly the same. 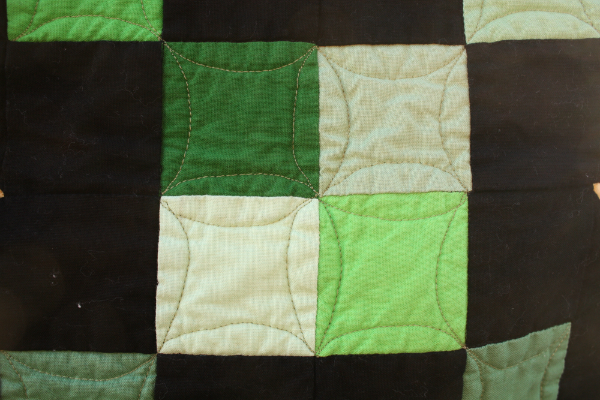 One evening, when I finished a long line of the green squares, I laid the quilt out on the floor to see how much I had left to go and where I wanted to start the next line. I was pleasantly surprised to find I was almost finished. 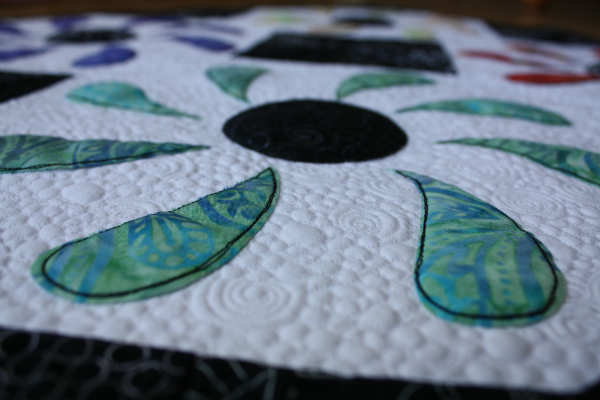 I also really liked how the back of the quilt looked with the black not quilted at all. I stared at it for a long time, wondering if I needed to quilt the black, and if so, how I would quilt it. Eventually I decided I'd leave the black plain, so instead of being about halfway through the quilting, I suddenly found myself almost finished! That's one way to finish quickly! As always, I love the look of the back! This is another finish for my Quarter 4 list for the year (after this quilt made an appearance on three lists!). So far I've finished three of the five things on that list, so I feel like I'm doing pretty well. Adam and Sandrine, here's hoping you have many, many years to read, watch movies and nap under your quilt! We love you both! Linking up to Let's Bee Social, NTT, TGIFF, Can I Get a Whoop Whoop and Finish it up Friday. Last week, for the start of Advent, we looked at the hope Jesus brought to the world. For this, the second week of Advent, we look at the peace He brings. Back when Paul and I were in university there was a big snowfall one day and we went for a walk late that evening. Everything was covered in a blanket of fresh white snow, fat snowflakes still filled the air and there wasn't much traffic or even other people walking. Everything was so quiet and calm. It was beautiful! When I think of peace, that's the sort of thing I think of...no distractions, no noisy traffic, everything beautiful, quiet and calm. Before He died, Jesus said to His disciples, "Peace I leave with you; my peace I give you" (John 14:27). I love that Jesus says He gives us His peace. Peace in this world is hard to come by. All the circumstances have to be just right for us to feel at peace. We have to feel safe. Everyone we care about must be healthy. Our finances must be sufficient and stable. Our jobs have to be pleasant and fulfilling. Our relationships have to be happy. Our bodies have to be free of aches and pains...the list goes on and on. If any one of these things is not just as we want it to be, we worry about it. The peace that comes from the world is completely dependent on our circumstances, and so it is fragile, easily shattered by an unexpected expense or an argument with our spouse. God's peace, though, is completely dependent only on Him. Because Jesus gives us His peace, it is a peace that has nothing to do with our circumstances. In Philippians 4:7, Paul calls it "the peace of God, which transcends all understanding" and tells us that it "will guard [our] hearts and [our] minds in Christ Jesus." It's not when our problems, aches and pains, or whatever, disappear that we have this peace that transcends all understanding. No, Paul tells us "Do not be anxious about anything, but in every situation, by prayer and petition, with thanksgiving, present your requests to God. And the peace of God, which transcends all understanding, will guard your hearts and your minds in Christ Jesus" (vv 6,7). 'In every situation', no matter what is going on in our lives, we can have the peace of God guard our hearts and our minds if we simply come to Him and present our requests to Him. Now, I'm not saying that if we present our requests to God, He will give us everything we ask for and then we'll have peace. It doesn't work that way! But if we talk to Him, if we have the kind of relationship with Him where we go to Him in prayer about everything, then we will have that peace that sometimes just doesn't make sense given the situation. It's peace that can only come from God because the circumstances don't warrant us feeling peaceful, and yet we do. There aren't many days that are the equivalent of a walk in a winter wonderland. Most days are loud and busy and full of distractions. But Jesus came into this world so that He can offer us His peace, even in the middle of all the noise and distractions. A couple of weeks ago someone on Instagram posted a picture of her daughter playing with fabric letters and I thought that would make a great Christmas gift for the two boys I babysit. I even thought to take pictures as I went along so that I could share a tutorial here. Sewing time has been a bit limited for me this week, so I'm still working on my two alphabets, but the letters really come along quickly. There's still time for you to make an alphabet or two for Christmas gifts! *Print out an alphabet in a font that you like. I used Aharoni and set the size to 550. To save paper, you can print on both sides of the paper. *Freezer paper. If you don't already have a roll of freezer paper, you can buy it in the grocery store, in the same aisle as the plastic wrap. *Fabric. This is a great project for scraps, which is how I'm making mine. *Fabric for the back of the letters. I'm using a big piece of muslin for the back of my letters. *Batting. This is a great use for small pieces of leftover batting. *Thread. I'm using a beige thread, which will blend with some fabrics and stand out on others, but since I'm going for scrappy with the fabrics there was no way to match everything. *Walking foot for your sewing machine (not pictured). The best part of this project is that it's coming entirely from my stash, and you can probably do the same! I did have to buy the pinking shears, but they're an investment in future sewing projects, right? Actually, I'm already making plans for another Christmas project I want to try using this same method. Hopefully I'll be able to share that in a week or so. 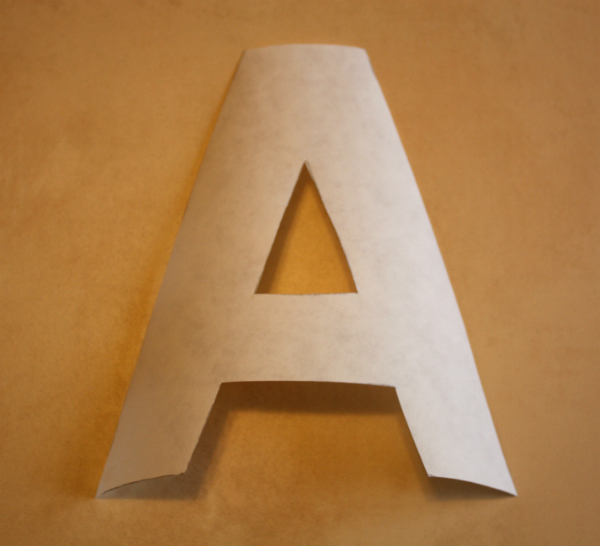 Place the freezer paper on top of your printed letters, shiny side down, and trace each letter. Cut out the templates with the paper scissors. 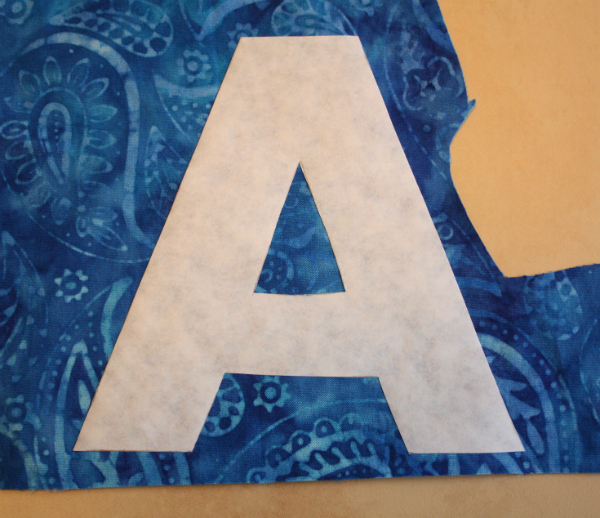 Again with the shiny side down, iron the freezer paper letters onto the right side of your fabric. Leave a small margin of fabric on all sides of the letters. 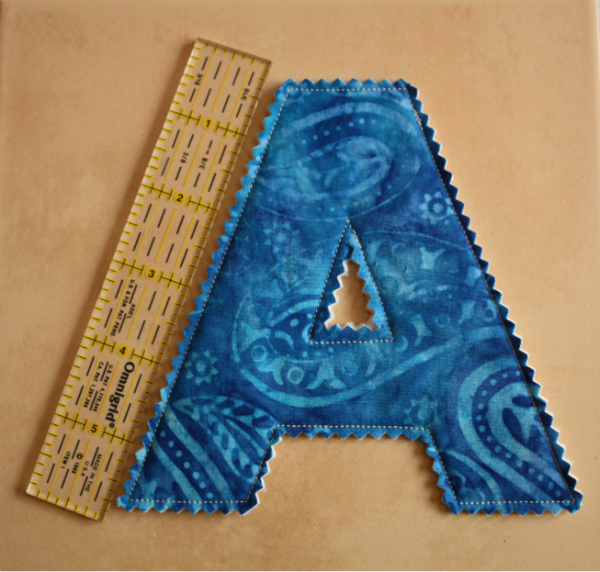 Layer the backing, batting and fabric with the fused letter, then pin together. If the freezer paper lifts off the fabric, just touch it again with the iron to re-adhere it. Shorten your stitch length slightly to make it easier to stitch around the curves of the letters. Then, with the walking foot on your sewing machine, stitch right at the edge of the freezer paper. Make sure to overlap your first couple of stitches with your last couple of stitches, and backstitch at the end. 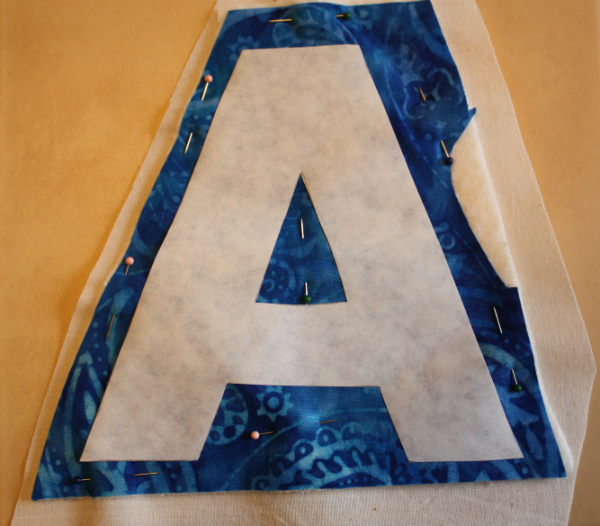 Remember also to stitch inside any holes in the letters, like in the middle of the A.
Peel off the freezer paper. 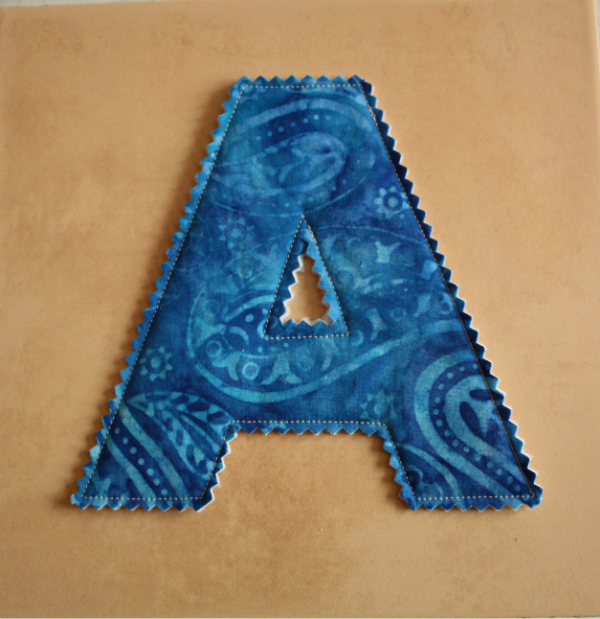 The freezer paper can be reused, so you can save the letters if you think you'll want to make another alphabet. 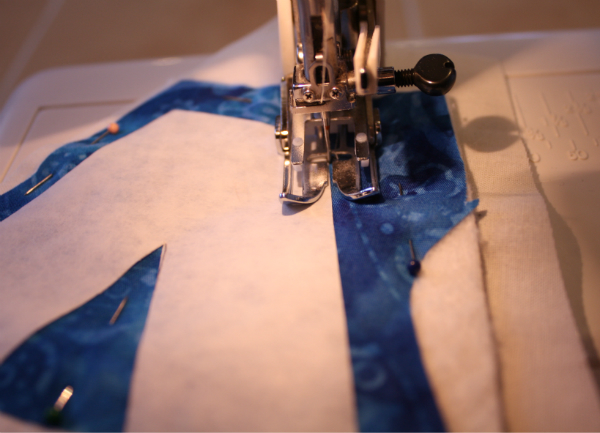 Use your pinking shears to trim the excess fabric away from the stitching lines. The pinked edge won't fray like a straight cut edge would, meaning you don't have to bind or otherwise finish the edges. It's not always easy to trim the holes in the middle of the letters, but it is possible! I use my regular fabric scissors to cut open a hole for the pinking shears and then carefully cut a tiny bit at a time. And yes, I have cut right through the stitching line once so far, but only just barely, so I restitched the line and I think it will be okay. My letters are almost 6" high, which I think will be a great size for toddlers and preschoolers to play with. And there you have it...a quick and simple, scrappy gift idea! I haven't decided yet how to gift the letters. I've been looking for a reason to make the 1 Hour Basket or I may make a drawstring bag or a denim pouch. I'll probably have to wait until I finish all of the letters before I decide. 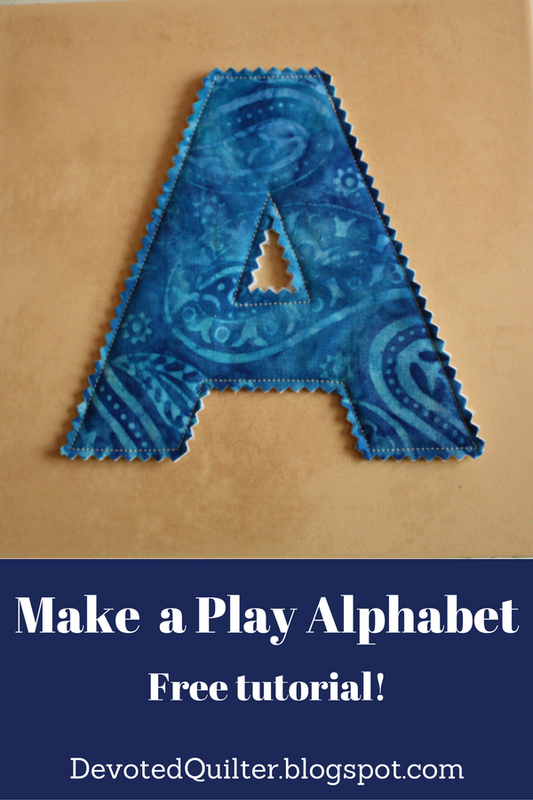 If you make a play alphabet using this tutorial, I'd love to see it! 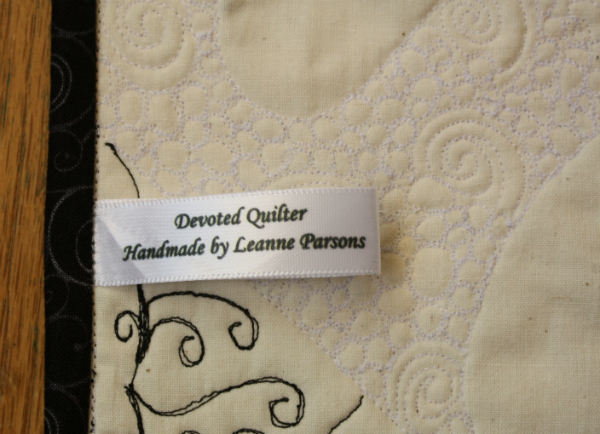 You can email a picture or blog post link to devotedquilter at gmail dot com, or tag me on Instagram (@devotedquilter). 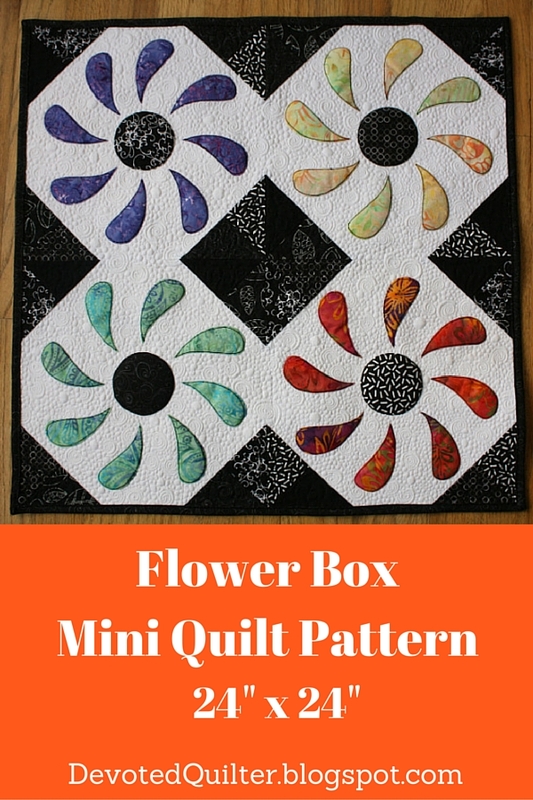 I am so excited to share my finished Flower Box mini quilt, and to release the pattern today! This is my third finish for this quarter of the Finish-a-Long, though it's the first one I've been able to share. The others will get their turn soon, I promise! 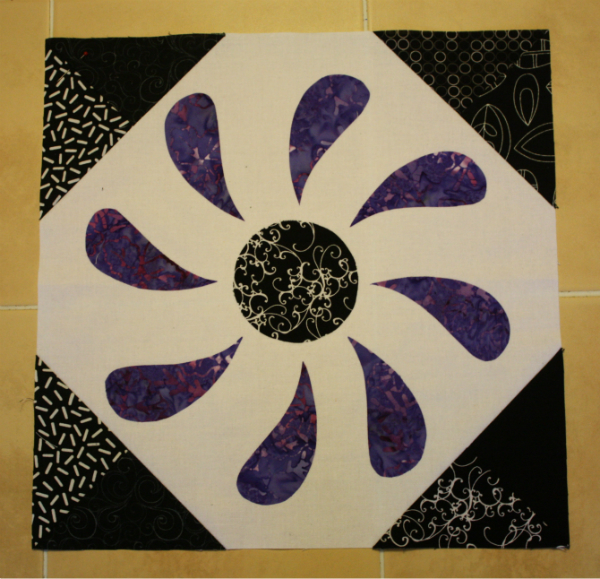 I debated for a while what to quilt around the flowers. I went back and forth between stippling and a mix of pebbles and swirls. I've done the stippling before, on the Flower Box cushion I made, so I decided to do the pebbles and swirls this time around. I'm so glad I did! I love the movement, and the interest it adds to the background, without overpowering the flowers. 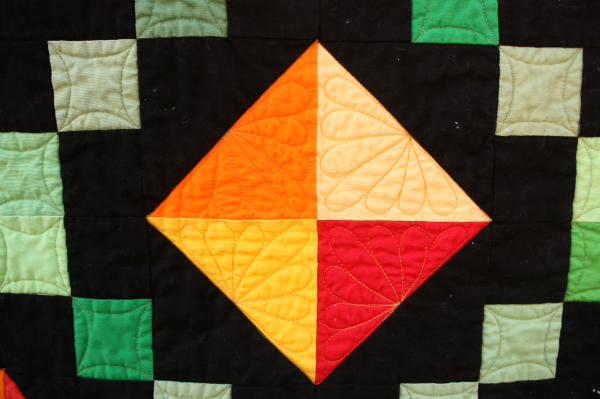 It took me a while to figure out what to quilt in the black triangles too. Once I found a design I liked, on Pinterest, I drew it a total of four times on paper before jumping right into the quilting. Hmmm...I might have been better off practicing a little more. The stitching isn't quite as neat as I would have liked, but I do really like the design. It hardly shows up on the front, but it really shows up on the back! 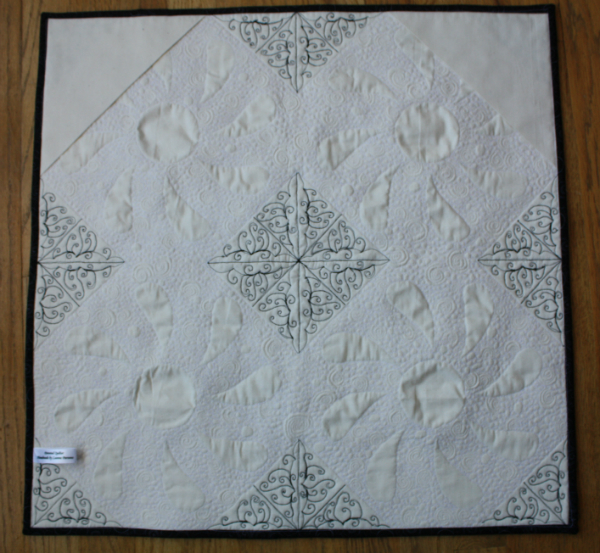 I love how the black quilting looks kind of like lace. I left the flowers unquilted, and I love how they puff up from the heavily quilted background. This is the third label from my gigantic roll of labels from Finer Ribbon. Only 997 left! The pattern is now available from my Payhip and Etsy shops. The pattern includes instructions for the 24" x 24" mini quilt, (which is the perfect size for a mini quilt swap or a quick gift!) and instructions for finishing one 12" block as a cushion. Here's a picture of the cushion I made a few months ago. If you make a Flower Box mini quilt or cushion, I'd love to see it! You can email a picture or blog post link to devotedquilter at gmail dot com or tag me on Instagram (@devotedquilter). I love celebrating Advent. The Christmas season is a busy one, with concerts and parties and shopping and baking and parades and...You know what it's like. It's easy to get overwhelmed, isn't it? The question, "Are you ready for Christmas?" really means, have you decorated and bought and cooked enough? In short, have you done enough? But really, all the hustle and bustle only gets us ready for the earthly side of Christmas, the gifts and family side of the holiday. Celebrating Advent gets us ready for the spiritual side. Lighting the candles in the Advent wreath and reading a short devotion reminds us that there is more to Christmas than presents and parties and stress. Advent helps put the focus back on Jesus. In the weeks to come, we'll look at Peace, Joy and Love. For this, the first week of Advent, we begin with Hope. The first person to know of the imminent arrival of the promised Savior was a priest named Zechariah. While Zechariah was in the temple one day, an angel appeared to him, telling him that his wife, who was old and barren, would conceive a son. That son, the angel said, would "make ready a people prepared for the Lord" (Luke 1:17). As most of us probably would have been, Zechariah was skeptical, and asked "How can I be sure of this? I am an old man and my wife is well along in years" (v. 18). His question seems reasonable, but for his skepticism, Zechariah was struck mute until the birth of his son, who, when grown, would come to be known as John the Baptist. When the baby was born and Zechariah wrote "His name is John" on a tablet, his voice was returned and he began to prophesy about Jesus (who had not yet been born). Zechariah said that He would come "to rescue us from the hand of our enemies, and to enable us to serve him without fear in holiness and righteousness before him all our days" (vv. 74,75). That, right there, is our hope. The religious leaders of His day didn't recognize Jesus as the Messiah because they were looking for a king who would save them from their Roman overlords. They were only looking for someone who would save them from their earthly enemies. Their view of their trouble, and the rescue God would send, was way too narrow. Jesus didn't come to save us from earthly enemies. He came to save us from sin and death, the enemies that keep us separated from God. Romans 8:1,2 says, "Therefore, there is now no condemnation for those who are in Christ Jesus, because through Christ Jesus the law of the Spirit who gives life has set you free from the law of sin and death." He has rescued us and set us free! Once we have been rescued from our enemies, we can then have a relationship with God. "See what great love the Father has lavished on us, that we should be called children of God! And that is what we are" (1 John 3:1). We are now able to love and serve Him without fear of punishment because Jesus came to take our punishment for us. We can come before God in holiness and righteousness, not because we are suddenly holy and righteous ourselves, but because we now have holiness and righteousness from Jesus. Philippians 3:9 says we don't have "a righteousness of [our] own that comes from the law, but that which is through faith in Christ—the righteousness that comes from God on the basis of faith." Without Jesus we have no holiness, no righteousness, and no chance of earning either one. But through faith in Him, we can "serve [God] without fear in holiness and righteousness before him all our days." 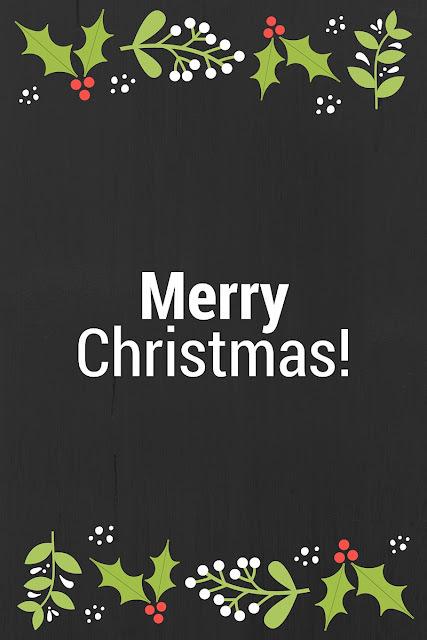 Zechariah's people had waited over 400 years for Jesus, but because of Christmas, the wait is over! We listen to mostly Christian music in our house. We love Third Day, Casting Crowns, Francesca Batistelli, Christy Knockels, Mercy Me and more. Looking back, the switch to mostly Christian music wasn't a conscious decision. It was simply a matter of finding more and more Christian music that we genuinely enjoyed, that expressed what we believe and is honestly just good music. I know very little about current music outside of the Christian genre, which sometimes makes me feel like I'm weird, like somehow I'm missing an important part of the culture, but mostly it doesn't bother me. Nathan seems to pay more attention to the lyrics of the music than anyone else in the house. Lots of times he's playing with his Lego, or drawing at the table and suddenly he'll say, "What does he mean, 'He that is living in me is greater than he that is living in the world?" We've had some interesting conversations about God in the last year as he has tried to understand the lyrics. It's been especially fun when he's confused because he's mishearing the words! In Deuteronomy, Moses tells the people of Israel, "These commandments that I give you today are to be on your hearts. Impress them on your children. Talk about them when you sit at home and when you walk along the road, when you lie down and when you get up. Tie them as symbols on your hands and bind them on your foreheads. Write them on the doorframes of your houses and on your gates" (Deuteronomy 6: 6-9). Now, to be honest, I've always thought that people who followed these directions would be trying to force every conversation to come around to God, trying to relate everything to God's commands. I thought it wouldn't feel like natural conversation. But really, this just means that these things are to be part of our everyday conversations, not limited to when we're inside the church building. Listening to Christian music helps to naturally start those conversations with Nathan because he's interested in what the lyrics say and he wants me to explain it to him. As for me, I find that a lot of the time the music is just in the background and I'm reading, or making supper, or playing games or whatever and not consciously paying attention to what I'm hearing. It sticks in my head though, even if I'm not paying attention. I'll play Bart Millard's CD Hymned Again while I make supper one evening and then the next morning in the shower I find "What a Friend We Have in Jesus" running through my head. Sometimes, too, when I haven't been paying attention to the music, I'll catch a line like "Even what the enemy means for evil, you turn it for our good, you turn it for our good, and for your glory" from Aaron Keyes' "Sovereign Over Us". What a great line! And what a great thought to have catch my attention. Philippians 4:8 says, "Finally, brothers and sisters, whatever is true, whatever is noble, whatever is right, whatever is pure, whatever is lovely, whatever is admirable—if anything is excellent or praiseworthy—think about such things." Listening to music that focuses on God is one way to keep those things front and center in my mind, and the minds of the whole family. There are a lot of influences in the world, trying to take our attention away from God. I love using Christian music to keep my attention where it should be. Do you listen to Christian music? If you do, who are your favourite artists? I'm always up for listening to someone new! I have the Flower Box blocks put together into a 24" mini quilt top. I love how those corners come together in the center. I think this design would look great made into a larger quilt too, but I only had enough white lying around for four blocks! I also love how the stitching looks on all of the flowers, but especially on the yellow one. The simple black outlining really helps those yellow petals stand out from the white. 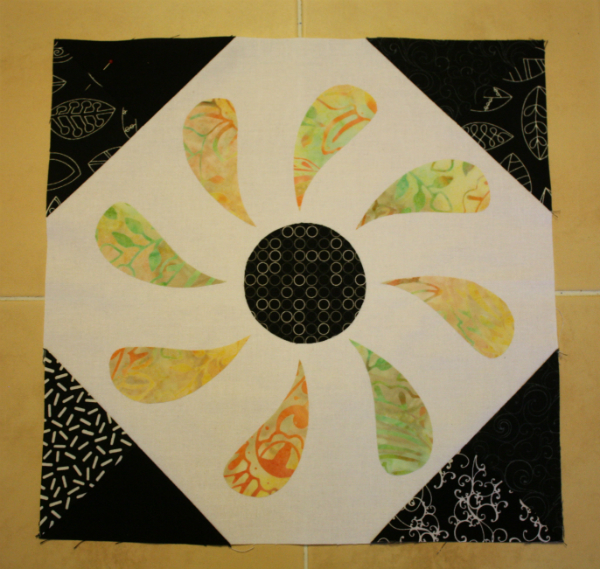 I have the quilt basted together now and I'm hoping to get started on the quilting later this evening. 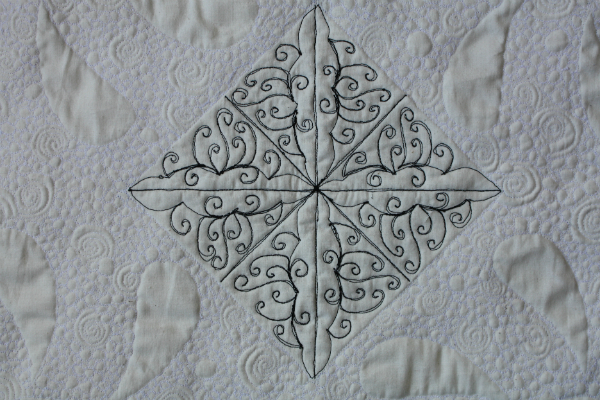 I'm still trying to decide what to quilt in the white...either a tight stipple or a combination of swirls and pebbles. What do you think? I've been working on the blocks for my Flower Box mini quilt. I'm making a 24" wall size, so I need four blocks. 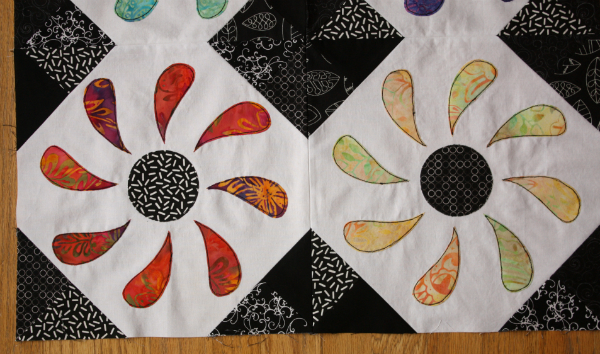 I decided to go with a variety of black fabrics for the corners and the flower centers. The flower petals are all made from a pack of batiks my sister-in-law gave me for Christmas last year. 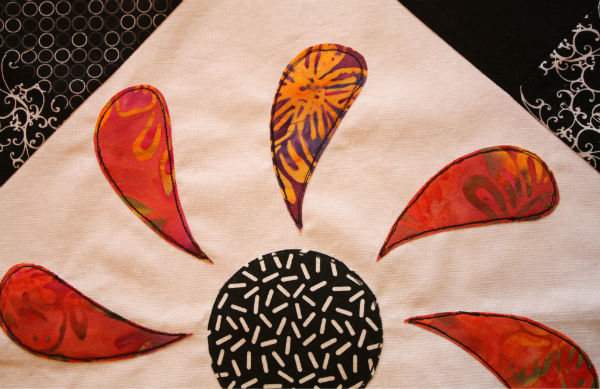 I really like how the bright batiks pop against the white background and the black corners. Last night I started stitching around the flowers. I had been debating how I would stitch around them for a while. On the cushion I made for Make Modern, I did a machine blanket stitch around the applique shapes, but I wanted something different this time. On Instagram I have really been admiring the work of @Mrs_Moog. She does a lot of free machine embroidery using black thread and I love the simplicity of it, so that's what I decided to go with for this quilt. 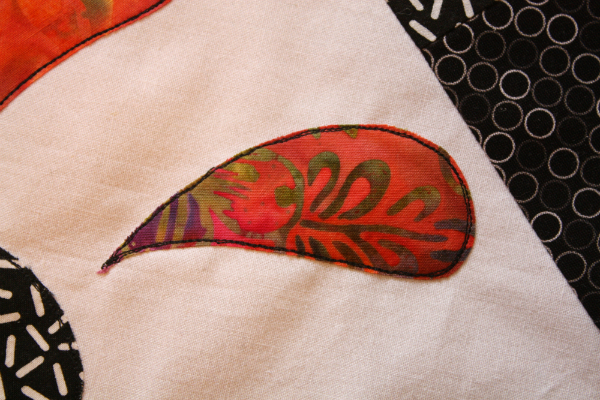 So far I have one of the four flowers stitched. As a bonus, using my free motion foot to stitch around the flowers is much faster than doing a blanket stitch! I love reading down through the comments stream on pictures on Instagram when there's a discussion going on. Yesterday a woman posted a picture along with a caption that said she was working on some Christmas things to distract her from the unpleasantness of living with teenagers. "How dare I ask her to empty the dishwasher?" she asked. What followed was commiseration from those who are also raising teenagers with attitude to spare, along with suggestions for how to make those teenagers more willing to pitch in and do what needs to be done. It was interesting to read, partly because Aiden is 13 (but not yet full of attitude) so we're just beginning our voyage through the teenage years, but mostly because those suggestions are so different from the things I do with the toddlers I babysit, who can't yet grasp the concept of getting their beloved technology back once the chores are finished. I read this passage of Isaiah with Aiden and Zachary the other night before they went to bed. Though at first glance it doesn't seem at all related, this is what came to mind as I read the Instagram suggestions for dealing with teenagers. When a farmer plows for planting, does he plow continually? I confess that when I first read this, I didn't see it as having any connection to raising teenagers, or to anything remotely connected to my life. I also confess I had no idea what it meant, especially since it seemed out of place coming as it does in the midst of Isaiah's prophecies of destruction. So, I headed online to see what the commentaries had to say. You can read those commentaries here, but I'll summarize a little, and I'm going to take it in two parts. Since most of us aren't farmers, Isaiah's example doesn't really make sense to us, so I'll relate it to parenting, which in turn will help us see how God works in our lives. First of all, the farmer has a variety of tasks that he needs to do in sequence (verses 23-26). He doesn't plow forever, but moves on from one task to the next, all working towards the goal of a harvest. As parents, we have to tailor our teaching to the ages of our children, with the end goal of raising capable, godly adults. When Zachary was two, we didn't ask him to make supper. Now, though, he is learning to cook. At first he and Paul worked together to make sloppy joes, which are his specialty, but now Zachary does all the work except for the cooking of the meat. Gradually, task by task, we teach our kids to take care of themselves, to be independent. In a spiritual sense, God has a plan for His people, which requires that He not always be doing the same thing in our lives. He works in us, bringing us closer and closer to being the Christ-like people He wants us to be. Sometimes He will be working to prepare us, other times He will be planting and tending the seed of some trait He wants to develop in us, and at other times He will, hopefully, bring in a harvest as that new character trait becomes part of us. The second part of the passage talks about threshing, which is certainly something I've never done and have no clue about. I buy my flour already ground and ready to use, thank you! But as I read, it seemed obvious that different grains have to be threshed (or separated from the inedible chaff) in different ways...what works for one won't work for the other. As I said, this passage comes in the midst of Isaiah's prophecy about the destruction that will come because God's people have been disobeying Him and have refused to heed the many stern warnings they've been given. According to the commentaries I read, the threshing symbolizes God's work in us too, but this time in the manner of discipline. Sometimes we need only a gentle reminder that what we are doing is wrong. Other times sterner measures are needed, like the destruction God would have to send on the people of Israel and Judah before He would get their attention. God knows how best to discipline us, just as the farmer knows how to thresh different grains, and just as we know to discipline our own children in different ways according to their ages and personalities. Proverbs 3:11,12 says, "My son, do not despise the Lord’s discipline, and do not resent his rebuke, because the Lord disciplines those he loves, as a father the son he delights in." Though we won't like being disciplined by God any more than our kids like being disciplined by us, we can be sure that we are being disciplined by a Father who loves us. Most importantly, always, no matter what stage we are at in our spiritual growth or what form the discipline takes, His goal is to make us better and never to cause us harm. Have you seen the Online Trunk Show being hosted by Soma at Whims and Fancies? 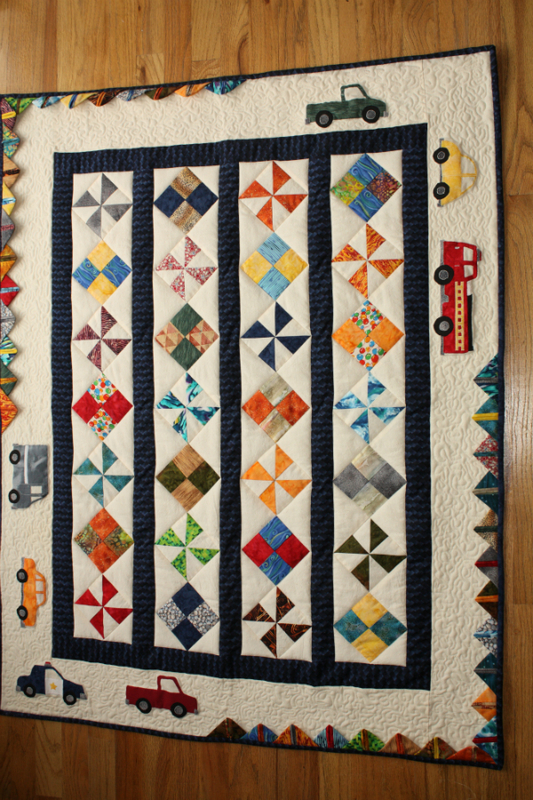 She has invited quilt bloggers to link up virtual trunk shows of their favourite quilts and it's been fun to sit back and check them all out. 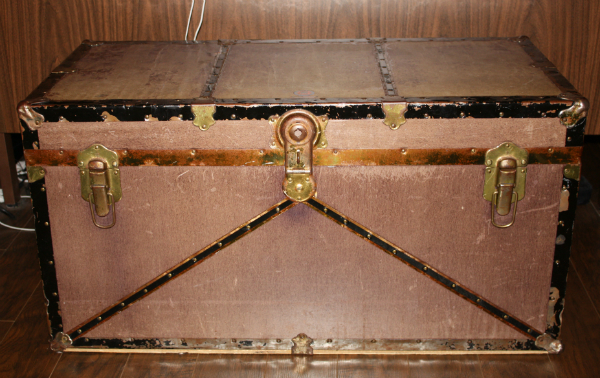 Before I open my virtual trunk and share some of my favourite quilts, I thought I'd share this fun fact: My fabric stash is stored in this real trunk, which my mother-in-law used when she went to university. 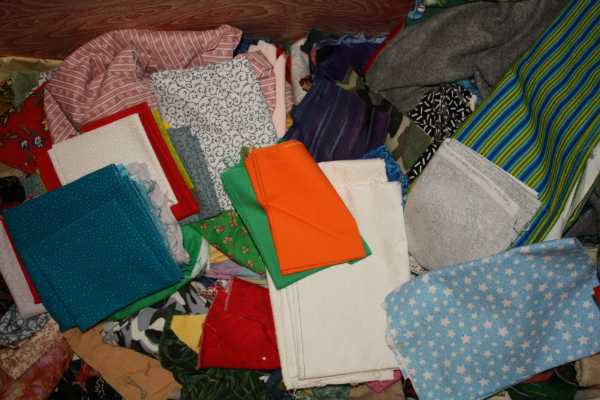 It's not at all organized, but I love rummaging around in the trunk to find fabric for a new project! 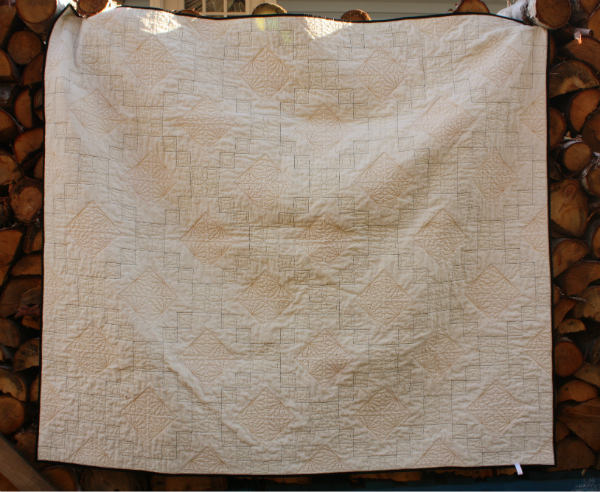 I'll start the trunk show with my very first quilt. I couldn't find a finished picture of it, so here's a shot of me working on it in the summer of 1997. 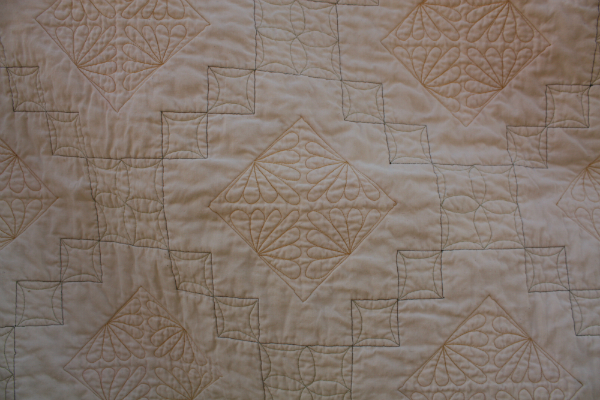 The quilt has tons of hand embroidery and was hand quilted along those chalk lines that are drawn in the sashing. It was a wedding gift for my friends Michelle and Brian. 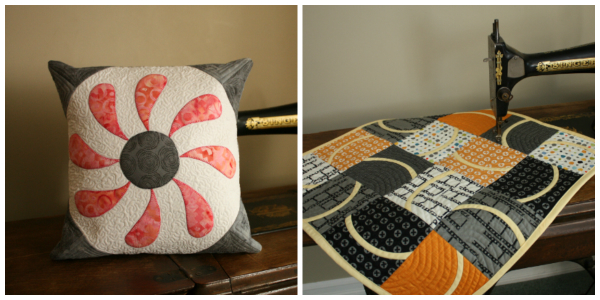 I made quilts for all three of my boys when they were born (or at least they were intended for when they were born!). Here is Aiden's quilt. The pattern is from the book A Quilter's Ark, by Margaret Rolfe. We used this quilt all the time when Aiden was a baby, until one day I noticed the threads I used to hand quilt it were disintegrating. I still don't know what happened! 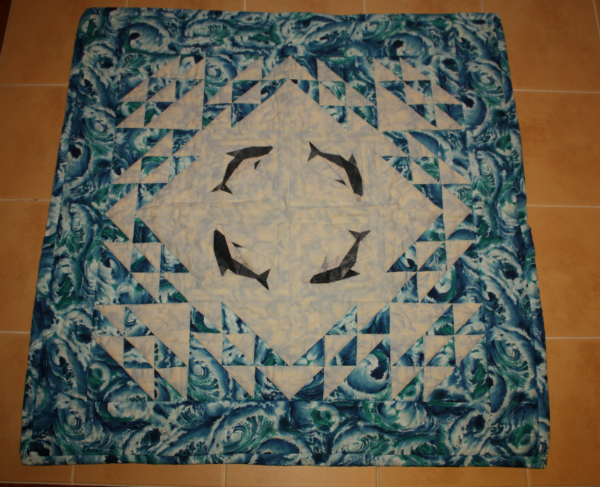 The pattern for Zachary's quilt came from Margaret Rolfe's book too.The funny thing is, Zachary is now very interested in animals, and dolphins are among his favourites. 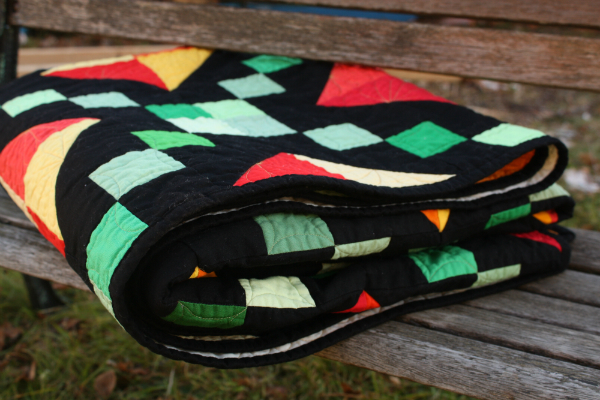 Nathan's quilt was one of my early free motion quilting ones. 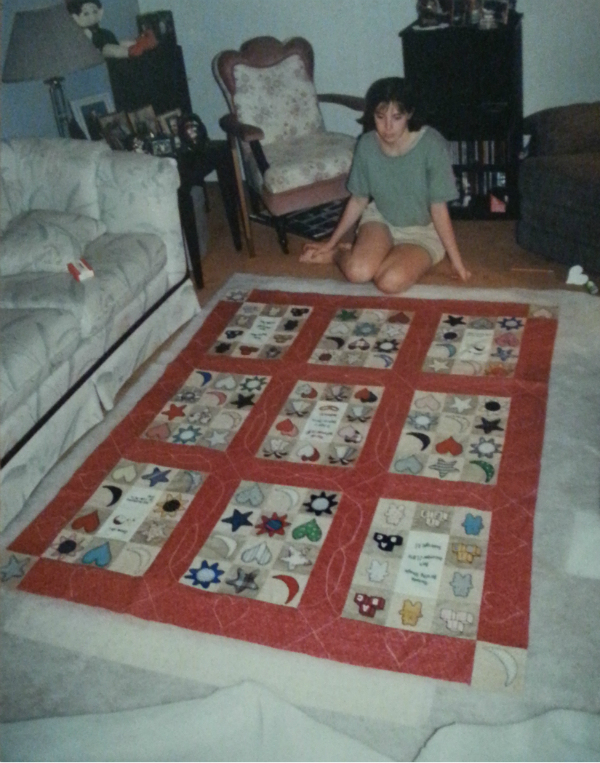 It's also the only one of their quilts that still hangs somewhere in the house...in this case, the family room. The pattern came from a magazine, but I can't remember who designed it. I added the vehicles around the borders from another pattern, which I also can't remember right now. And, not to leave my husband out, I made him a coffee quilt. This pattern was from the book Stack a New Deck, by Karla Alexander. It was hanging in our living room until a couple of weeks ago and we haven't found a new home for it yet. This is my Scrappy Log Cabin quilt. 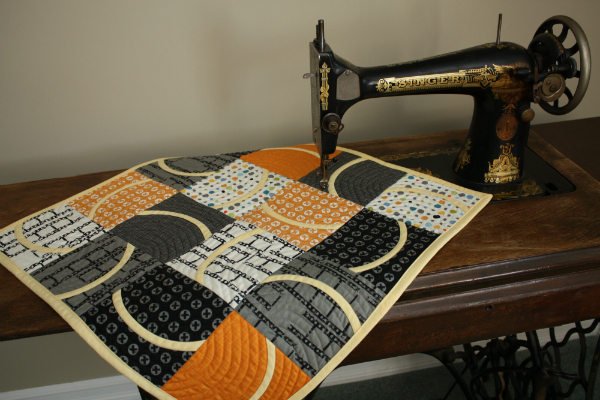 If learning a new skill is mostly a matter of practice, this quilt played a big part in my free motion quilting skills! I think somewhere in the vicinity of 3 1/2 km of thread went into quilting this one! 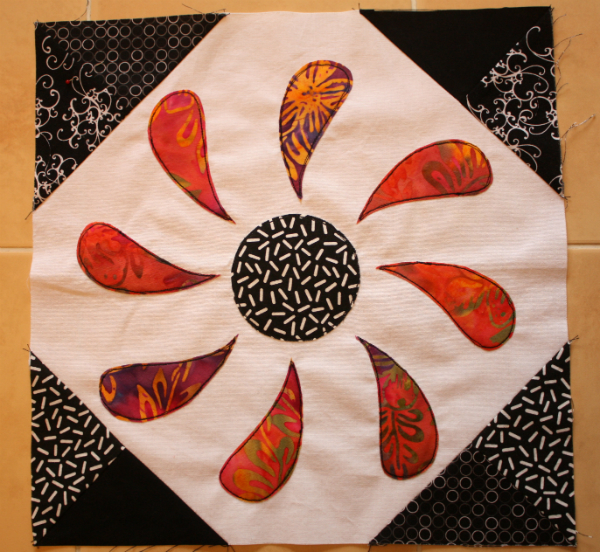 This next one was made for the Schniztel and Boo Mini Quilt Swap, round 2. 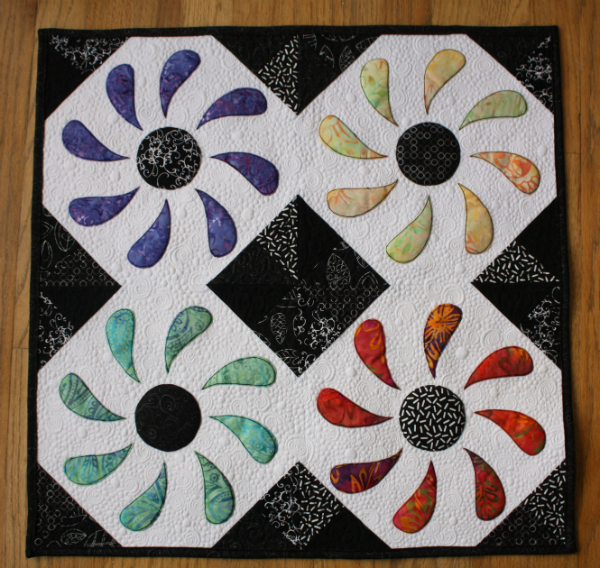 I used a block from Quiltmaker's 100 Blocks magazine called Spin Cycle, which was designed by Gudrun Erla. 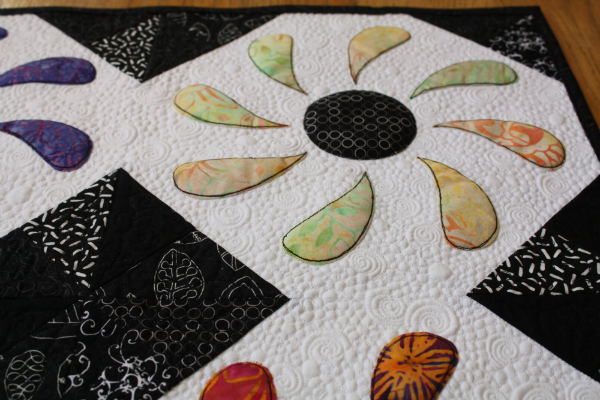 I did a lot of free motion quilting in the white sections and this was the first quilt where I felt like I had gone from a beginner to an intermediate fmq quilter. 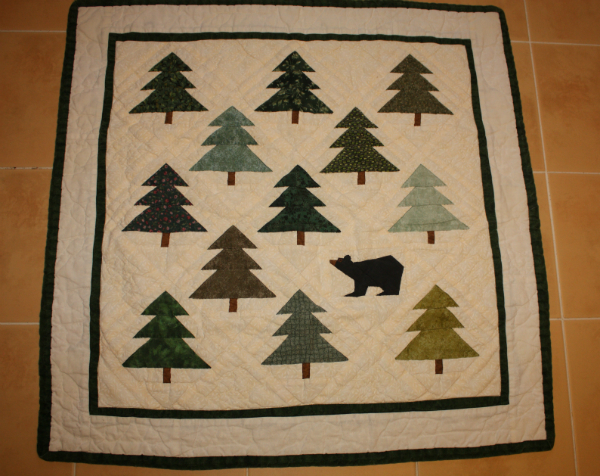 My And Sew On quilt was the first one I made that was inspired by a 'squirrel' moment because of something I found online. 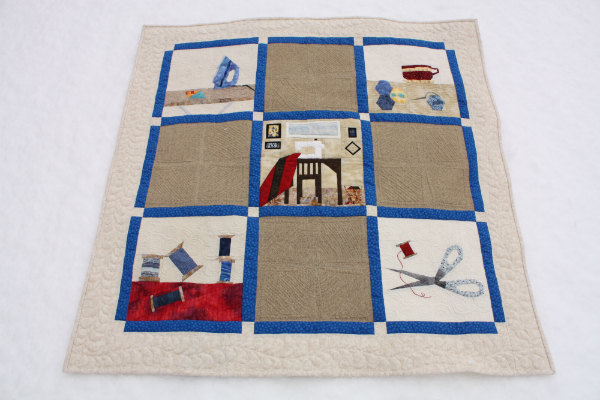 I stumbled onto Kristy's blog, Quiet Play, when she released the scissors block in her 2013 And Sew On BOM. It was just so cute, I had to make it! I made four more blocks from the series for this quilt that now hangs in our downstairs hallway. My Flower Box cushion cover pattern was in Make Modern magazine. I was so excited about my first published pattern! Now I'm working on a wall hanging made with four of these blocks and I plan to release the pattern in my Payhip and Etsy shops within the next couple of weeks. The last one I'll share for my trunk show is Noodles, which was designed for the Curves issue of Fat Quarterly magazine. It was fun making this one because it was only my second attempt at sewing curves and it was exciting to see each block come together the way it was supposed to! Noodles lives permanently on Miss Cleo, the 1923 Singer treadle machine in our entryway. Thanks for coming to visit for my trunk show! 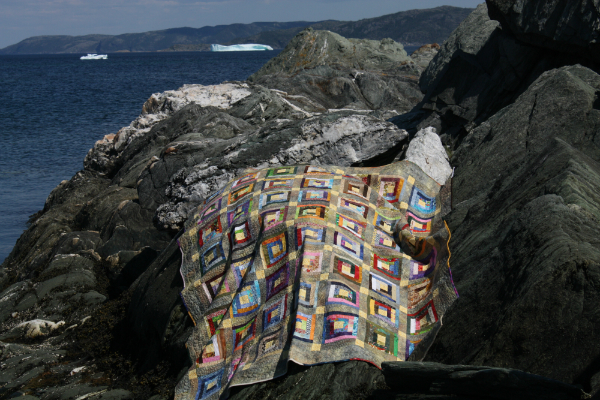 If you're interested in sharing your own favourite quilts, the linky will remain open until November 18th, so there's still time to get in on the fun.